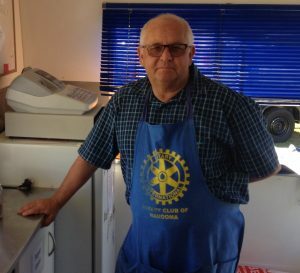 About Us – Narooma Rotary Club Inc.
Narooma Rotary Club Inc. is a not-for-profit community organisation dedicated to serving and supporting both the local Narooma community, as well as the wider global community. Chartered in 1958, Narooma Rotary is a dynamic club committed to expanding members’ opportunities for service, personal growth and enjoyment. Through our shared commitment to service, members are already engaged in Rotary programs and activities that have achieved worthwhile outcomes locally, nationally and globally. These have produced benefits to individuals, organisations and even whole communities. We have seen that when we engage Rotary, we can change lives and the extraordinary success of our End Polio Now campaign shows what can be achieved when people work cooperatively together. We are members of an international family of 1.2 Million Rotarians, each of whom has made a commitment to be guided by the Rotary Four Way Test. Will it be BENEFICIAL to the environment? Below is a four minute video by Rotary International that explains a lot about our organisation. For more information about Rotary International, please visit the Rotary International ‘About Us’ webpage.